Another friend of Jaha Koo has just committed suicide. 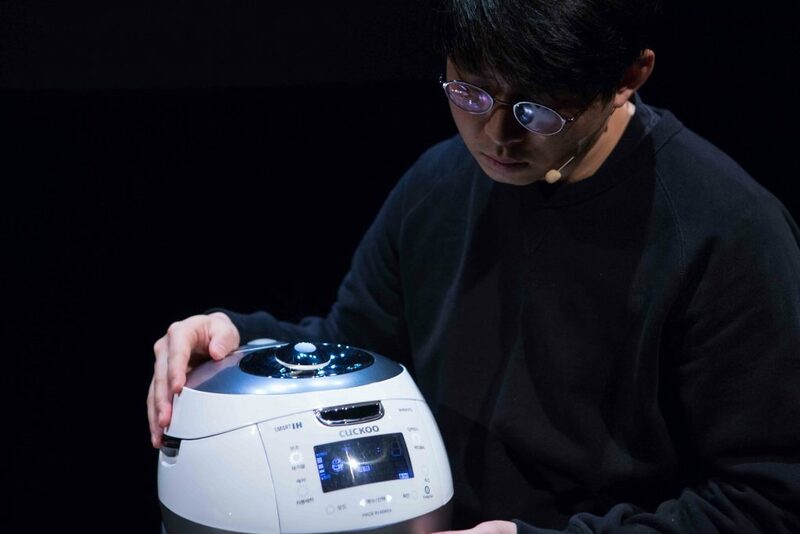 The voice of his rice cooker announces that his meal is ready. He feels oddly comforted—he is not alone. Cuckoo is the name of a popular brand of household appliances. 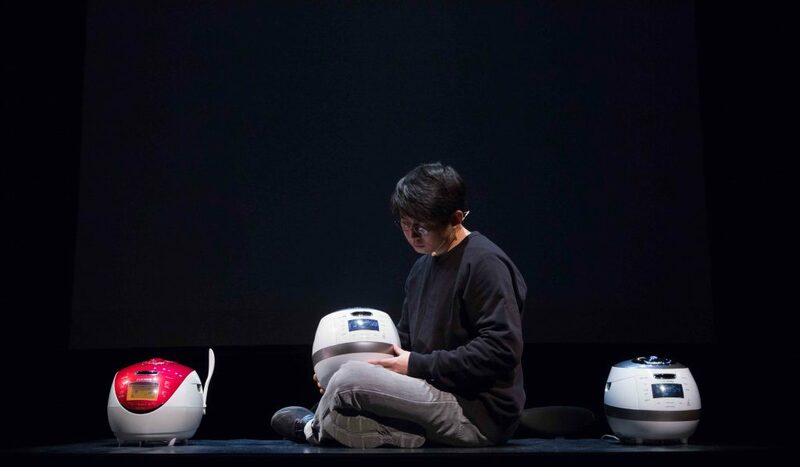 Onstage three rice cookers talk, argue and sing songs. 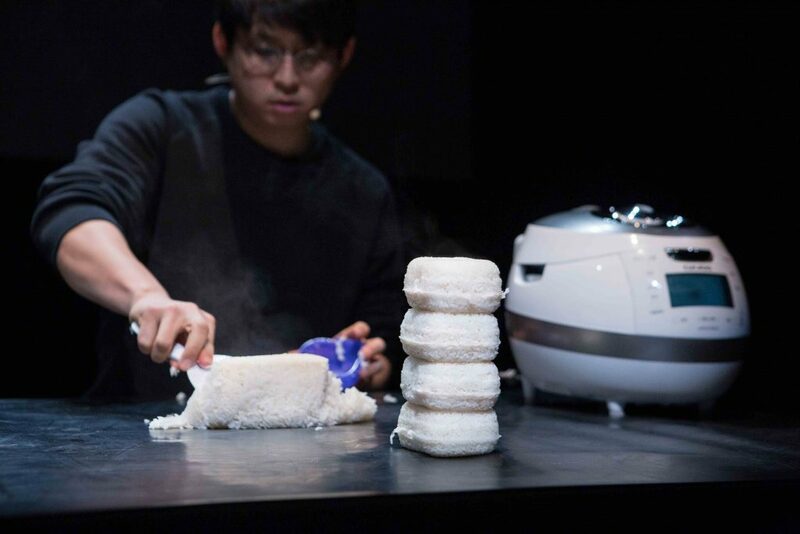 This atypical stage presentation crystallizes the solitude generated by technological progress as it portrays a panorama of the economic and social debacle of South Korea. Twenty years ago, a huge financial crisis shook the country. Bankruptcies, massive debt loads, an entire generation unable to find work, no future and no hope. Surrounded by Cuckoo appliances, symbols of the industrial success of his native land, and by powerful archival images, the artist paints a bittersweet portrait of the life of a young Korean. An unsparing analysis of a society that has embraced capitalism and now suffers the consequences of out-of-control growth. After the rush, disillusioned days to come. 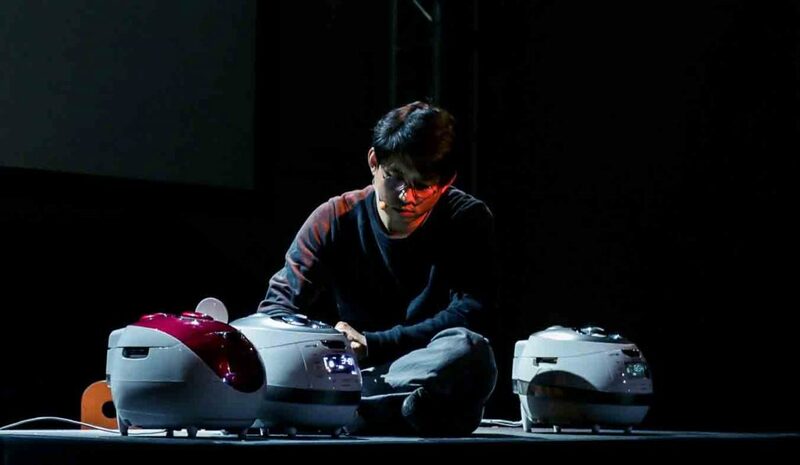 Born (1984) and raised in South Korea, the performance artist Jaha Koo attended university there before moving to Holland, where he obtained a Master’s degree in theatre studies in Amsterdam. His shows are intimate and personal in nature, touching on his views of the society he grew up in, as well as international politics and urgent economic issues. 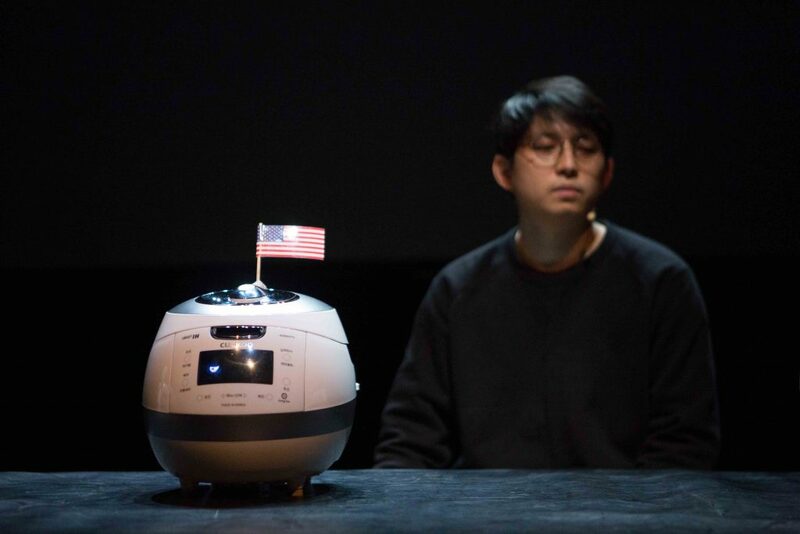 He repurposes household objects, makes use of video imagery, composes his own soundtracks and sees himself not as an auteur or director, but as a theatre maker. In 2014 he conceived the Hamartia Trilogy, based on the idea that events of the inescapable past affect our lives today. The first part of the trilogy, Lolling and Rolling, premiered in 2015 at the Zürcher Theater Spektakel in Zurich. An indictment of the Americanization of South Korea, it describes the difficulties Koreans have learning English. The second part, Cuckoo, made its début at the Steirischer Herbst festival in Austria in 2017, and went on to tour Europe and Seoul. 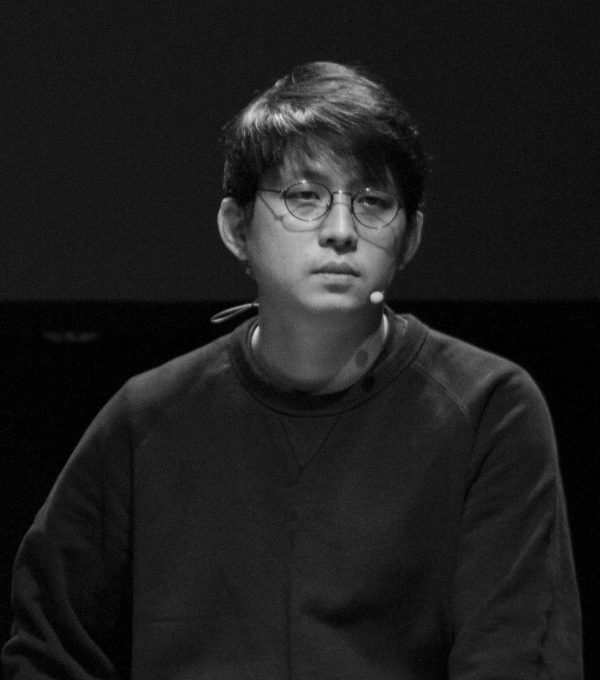 The last part, provisionally titled The History of Korean Western Theater, will be presented in spring 2020 at the CAMPO art centre in Ghent. Also a musician and composer, he produced an EP, Copper and Oyster, under the pseudonym GuJAHA in 2015. He lives in Amsterdam and Brussels. 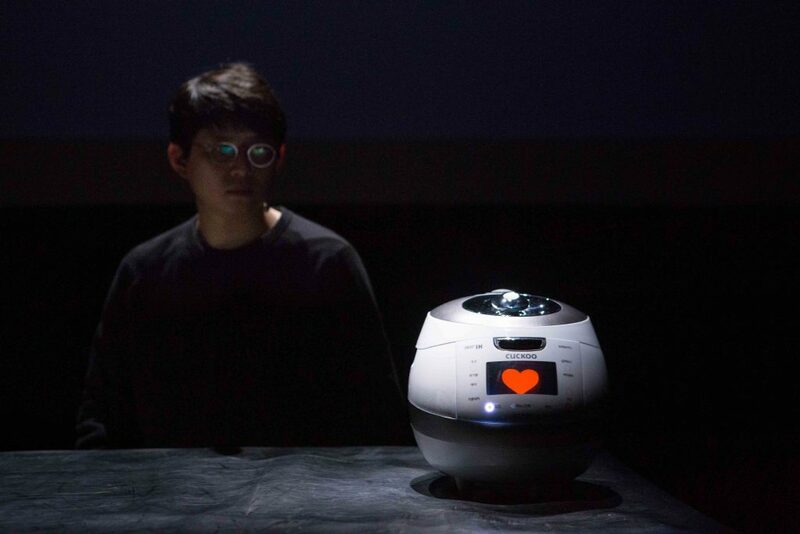 Cuckoo is the brand name of an electric rice cooker, and you use that simple object to broach complex ideas. Did you start out by wanting to discuss the failure of neo-liberalism and its repercussions on South Korean society? I portray aspects of the history of South Korea, a place where I’ve not lived for a number of years now. From a distance, I can see how that society has evolved very little, I can reveal things perhaps not noticed by those who live there. For example, Korean politicians and economists know the former American secretary of state Robert Rubin, who was a major proponent of structural reforms to liberalize the economy in the 1990s. What many don’t know is that he imposed on the people of South Korea and other emerging nations measures that caused the standard of living to deteriorate considerably. One of my objectives was to show how he contributed to the economic crisis in South Korea. Cuckoo is the second part of a trilogy. The first part, Lolling and Rolling, is about the country’s ambition to become as powerful as Japan or the United States. It’s also about learning English in South Korea, where some people go so far as to have tongue surgery in order to improve their pronunciation. I’m trying to find a personal approach to these wide-ranging subjects, experimenting on the basis of what touches me personally, then expanding from that to discussing the global economy, of course, about failure of neo-liberalism and its repercussions on our contemporary world including South Korean society as well. When I began creating performances, I wanted to experiment with approaches I had never seen in the conservative environment I grew up in. To do something new, something different, was a political gesture against consumerism. In the show you deplore the fact that Korea has the world’s second highest suicide rate. Is that because of the pressure to succeed? Pressure is everywhere: at work, within the family, at school. It is a very capitalist society, extremely materialistic. That sort of environment forces people to perform, to pursue professional and financial success. Not being the best in your field is a source of great frustration for those who do not do as well as they had imagined, a huge disappointment to family and friends. And the pressure is increasing. Over the past two decades, the suicide rate has risen year by year. When the Korean firm created the Cuckoo brand, I thought they were thinking about the English word cook and the owner’s family name ‘Koo’, my family name is also Koo, but we don’t know each other anyway. Also thinking about the bird, and the cooker does look a bit like a cuckoo bird. In English of course, that word can also mean to be crazy. I find it an ironic name for a pressure cooker, particularly so in South Korea where the pressure drives some people mad. You say you want to do theatre without actors, yet here you are onstage. Would you rather not be there? I don’t see how the three parts of my trilogy could be presented without my presence. I have to be there, I have to tell the story. I’m at the center of it. I don’t see myself as an auteur or as a director, but as a theatre maker. I don’t like being onstage. I really don’t see myself as an actor; I have no training in acting. I try the best I can to establish a connection with the audience that has come to see my show. I have a big responsibility to tell the story well, to connect with the spectators even though I am reticent about being onstage. It is very solitary work. I call on a dramaturg and a set designer who helps me create the playing space, but I compose the music, I choose the images that will be seen onstage, I write the text and decide on the direction and concept it will all take. In that sense I find myself closer to contemporary arts. I’m an independent theatre maker – that’s the best definition of who I am.